Apple has legally acquired rights to use the Lightning name for its new connection solution after sealing a deal with the Harley-Davidson Motor Company. Patently Apple discovered in Apple's filings to the U.S. Patent and Trademark Office (USPTO) that Harley and Apple were able to reach a "partial transfer" on the name in Europe. The agreement allows both companies to legally make use of the name, while preventing other parties from ripping it off. TV and AR glasses hint? The applicable uses of the word for both companies covers a rather broad scope. Among those agreed-upon uses are television sets, eyeglasses, speedometers, AV equipment, golf tees and vending machines. The mention of TV sets and eyeglasses will no doubt provoke speculation that Apple will be using the tech in any flatscreen TV or pair of AR glasses it may be planning to manufacture. One passage from the USPTO filing reads: "This Class includes, in particular: amusement and game apparatus adapted for use with an external display screen or monitor." 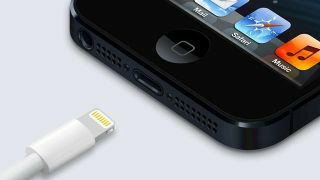 Apple's new Lightning cable and connector, announced next to the iPhone 5 in September, offers a smaller 8-pin, reversible solution. It replaced the 30-pin connector that Apple had used in portable devices for the previous decade. New tech to feature the Lightning connector includes the iPhone 5, iPad Mini and 5th generation iPod touch. And while Lightning-branded golf tees are intriguing, perhaps we'll see an Apple and Harley hog hit the streets before long?